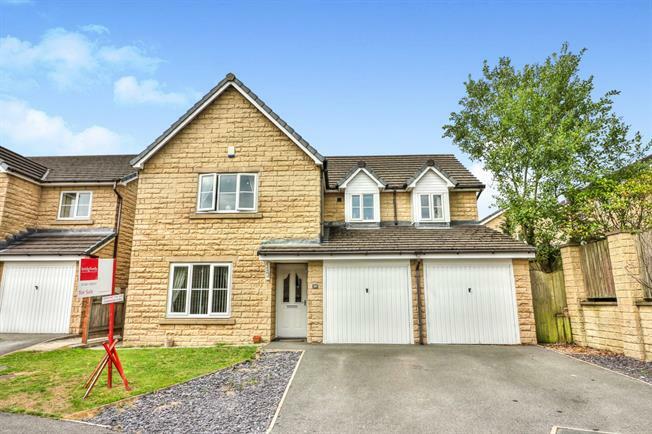 5 Bedroom Detached House For Sale in Nelson for Offers Over £260,000. Internal inspection of this large, executive detached home is highly recommended to appreciate just how much accommodation is on offer. Already offering masses of living space, there is also the potential to convert the integral double garage into a downstairs bedroom or further sitting area. Comprising of five generous bedrooms (two with en suite bathrooms), bathroom, two reception rooms, kitchen with dining area, utility room, downstairs w.c and large conservatory to the rear. To the front there is a double driveway and a garden to the rear. Double glazed door. Part tiled walls, ceiling light. Roll edge work surface, base units, space for washing machine. Double glazed door opening onto the driveway. Radiator, laminate flooring, under stair storage, ceiling light. Access to the garage and stairs to the first floor. UPVC double double glazed door. Radiator, laminate flooring, ceiling light. Double glazed uPVC window facing the rear overlooking the garden. Radiator, tiled flooring, part tiled walls, ceiling light. Roll edge work surface, wall and base units, one and a half bowl sink and with mixer tap with drainer, integrated electric double oven, integrated gas hob, integrated standard dishwasher, integrated fridge and freezer. UPVC double double glazed door opening onto the patio. Triple aspect double glazed uPVC windows overlooking the garden. Radiator, karndean flooring, ceiling light. Garage and double , opening onto the driveway. Double glazed uPVC window facing the rear. Radiator, laminate flooring, fitted wardrobes, ceiling light. Double glazed uPVC window with patterned glass facing the side. Radiator, part tiled walls, ceiling light. Low level WC, single enclosure shower, pedestal sink, extractor fan. Double glazed uPVC window with patterned glass facing the front. Radiator, part tiled walls, ceiling light. Low level WC, panelled bath with mixer tap and shower over bath, pedestal sink with mixer tap, extractor fan. To the rear there a Indian stone patio with a retaining whoch has steps leading to a well proportioned laid to lawn area, there is a shed, fence to the perimeter, water point and paths providing gated access to both sides and the front of the property. To the front there is a double tarmac drive which provides access to the double integral garage, an external light point, coloured slate area and a laid to lawn area. There is also gated access to both sides of the property.